There are three possible configurations for the categories. You can set a general price for all your categories in the configuration page of PaidSystem. You just have to fill the 'Category Price' field with the price you want. This page displays a table listing all the categories configured in the AdsManager component. 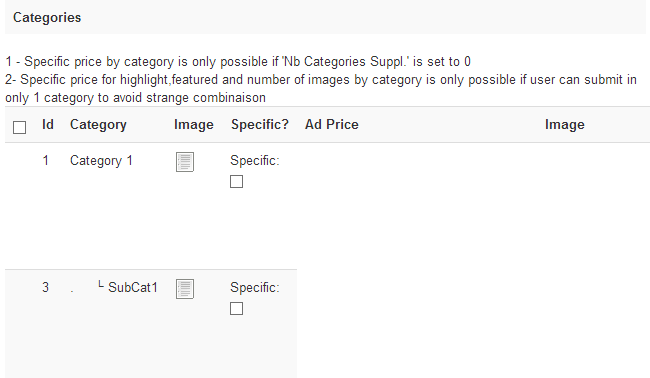 But unlike AdsManager, you can assign a specific price to the desired category. Note: Before adding a price to a category, you must first take a look to two restrictions noted in the top. 1. You can assign a price to a category only if you set the 'Extra Categories' parameter to 0 in the PaidSystem configuration. 2. You can assign a price to a category only if you forbid the ability to post an ad in multiple categories. These restrictions are present to prevent users from paying for the same category more than once. To add a price, check the 'Specific' check box for the field corresponding to your category. Once checked, a new text field appears, you only have to fill this field and submit the form. Tips : in this page, you can also define a price for all the supplemental images the user might want add to its ads. This solution work only in multiple categories mode. You can set the maximum number of categories that can be selected by filling the field 'Nb. Categories Suppl.'. The price of the first selected category will be the one set to the 'Category Price' field. All the others categories selected after the first will cost the amount specified in the 'Additionnal Category Price'.